The Platform Tension Retrofit Kit allows all Model 16020 Stability Platforms to be outfitted with adjustable tension capability. 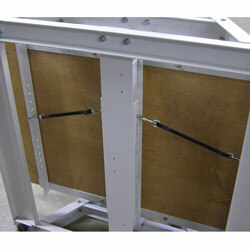 The kit consists of tension straps and brackets that fit onto the center brace of the stand and the underside of the wooden platform. The tension impedes the swing of the platform, making the balancing task less difficult. The tension is adjusted by placing straps on the bottom of the platform. Each strap is stretched between the bracket holes on the platform base and on the platform itself. Given the number of bracket hole positions, a virtually unlimited number of strap configurations is possible. The included tables and charts show the characteristics of common strap configurations. The specific setup used will depend on the desired tension characteristics. The recommended configurations can be modified to suit a particular application, but the user should be careful not to exceed the minimum and maximum strap tension for each platform height setting.